Skyfall, the 23rd official James Bond film outing, is directed by Sam Mendes, marking the first time a Bond adventure has been helmed by an Academy Award-winning filmmaker (he won for 1999’s American Beauty). That goes a long way in making Skyfall is one of the finest entries in the 50-year-old franchise—it delivers the action, thrills and intrigue that the franchise demands with a surplus of style and class, while offering a story that contains some genuine emotional resonance for characters that audiences have come to know very well over the previous five decades. Written by Neal Purvis, Robert Wade and John Logan, the film finds an injured and weary Bond (Daniel Craig, Cowboys & Aliens) having to deal with a changing-with-the-times MI6 spy agency, a troubled boss, M (Judi Dench, Jane Eyre), who’s being pressured to retire, and a vengeful cyber-terrorist named Silva (Javier Bardem, Eat Pray Love) who’s using his computer to kill as many British agents as he can. In tackling this newest breed of villain, a recovering Bond globe-hops from Turkey to Shanghai to Macau to, finally, London, where his heretofore unknown past—“Skyfall” is the name of his childhood home–comes into play as he fights for his life and the future of MI6. By the end, everything old is truly new again, and the franchise gets the freshest injection of life that it’s ever received. 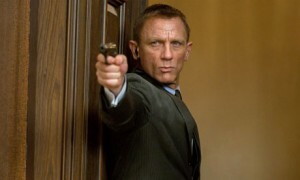 Though the Bond films of the Daniel Craig era have been the most “personal” ones in the series, Skyfall takes it to the next level, most notably in its look at Bond’s familial history and his career-long relationship with M. But the inclusion of that “character stuff” doesn’t hinder from the formula’s primary ingredients, which shine in a dynamite pre-credit action sequence and subsequent subterranean chase scene, the presence of striking Bond babes Naomie Harris (28 Days Later) and Bérénice Marlohe, and an eccentric performance by the villainous Bardem (who’s physical flirtation with Bond is definitely a first for the series). The video and audio quality of the Blu-ray is outstanding, with the Shanghai and Macau sequences leading the way with their seductive neon glow. The Blu-ray contains a modest but appropriate selection of bonus features, beginning with two commentary tracks: one by director Mendes and another with producers Barbara Broccoli and Michael G. Wilson and production designer Dennis Gassner. Both commentaries are worth a listen, particularly the Mendes track, which is the more insightful of the two—it’s obvious the filmmaker was carefully watching every scene while he talking about the film’s scripting, shooting and editing. For my money, the hour-long Shooting Bond documentary is the winner here. The doc, which can be viewed as a single film or broken down into a dozen-plus featurettes, broadly covers all aspects of the production–the casting, locations, action scenes, music, title sequence and more. All the film’s principals are on board, though I wished we heard a little more from the great cinematographer Roger Deakins, whose gorgeous lighting and camera setups for Skyfall earned him an Academy Award nomination. Here’s hoping the nine-time Academy Award nominee brings home the Oscar for his work on one of the most gorgeous-looking Bond films I’ve ever seen.